Sometime after the age of 40, most people start to notice some changes in their vision. It’s typically in this decade of life that eyes begin to lose the ability to focus on objects up close—especially in dim lighting conditions. A normal, age-related condition called presbyopia is usually to blame for these difficulties. Although everyone gets presbyopia, it doesn’t have to signal the end of youth – or good vision. On the contrary, there are several vision correction options specifically designed to address the condition. Whether you had perfect vision before or have always needed glasses or contacts, you can overcome the visual challenges of presbyopia—even if you have astigmatism. Depending on your lifestyle, personal preferences and ocular health, you may be able to choose from several options—including readers, full time glasses, contact lenses, or a combination of contact lenses and glasses. Which one is right for you? Here’s some information to help you decide. Since presbyopia doesn’t affect your ability to see things far away, reading glasses are an obvious choice for seeing things up close, especially if your vision is otherwise perfect. But you may not be comfortable peering over the top of reading glasses to see into the distance. And, if you already wear glasses, switching back and forth between a distance prescription and a reading prescription can be a real hassle. Bifocals and progressives are an alternative as long as you don’t mind always wearing glasses. 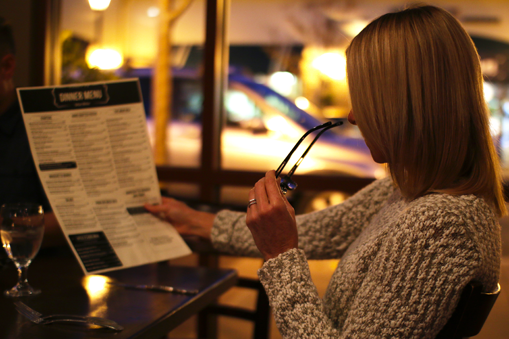 Bifocals contain two prescriptions–usually one for distance up top and one for near at the bottom of the lens. In some older designs, you can see the line that separates these two prescriptions. Progressive lenses are another spectacle alternative. Progressive glasses contain multiple lens powers in different areas of the lens and do not have a noticeable line. If none of these options sound appealing to you, it may be time to explore contact lenses for presbyopia. Fortunately, there are many contact lens choices for presbyopes. To help you see well at all distances, your doctor will first need to decide whether to offer you monovision or a multifocal lens. Like single-vision glasses, monovision contact lenses have only one power. To help you see at different distances, your doctor will put a distance vision prescription in one eye and a near vision prescription in the other. A multifocal contact lens contains multiple powers or prescriptions on a single lens—much like progressive glasses do. Also, like progressive glasses, multifocal contact lenses may require an adjustment period while you get used to your new vision, but the end result is worth it. On the other hand, unlike progressive glasses, multifocal contact lenses do not require you to tilt your head to find the right spot for seeing at different distances. These contact lenses can come in a variety of materials, including soft, hard gas permeable or a combination of the two in a hybrid lens, which provides the clear vision of a gas permeable lens and the comfort of a soft lens. Duette Progressive is the newest hybrid contact lens for presbyopes of all ages. For those who need extra help seeing up close, the power in the lens gradually changes from near to distance to provide natural vision at all distances. These lenses can even be worn by patients who have astigmatism—in fact, this is where these types of lenses truly excel. Is Presbyopia New to You? Progressive contact lenses, such as Duette, can offer freedom from glasses to presbyopes of all ages. However, if you are just recently beginning to develop presbyopia, you may not need as much near vision correction as a more advanced presbyope requires. To address the unique needs of “presbyopia newbies,” SynergEyes is releasing a specially designed progressive contact lens. This new Duette Progressive features a center distance optical design that is particularly well-suited to emerging and younger presbyopes. If you’re over 40 and are starting to struggle with near vision, don’t despair. Thanks to newer technology most patients have the freedom to manage presbyopia as they wish. Indeed, there are currently great contact lens options for patients of all ages. It all boils down to lifestyle and personal preference.